Disclosure: I received free products in exchange for providing my unbiased review of Oriental Trading Company products. All opinions expressed are my own. Even though Christmas is my favorite holiday, we’ve only hosted one Christmas dinner. 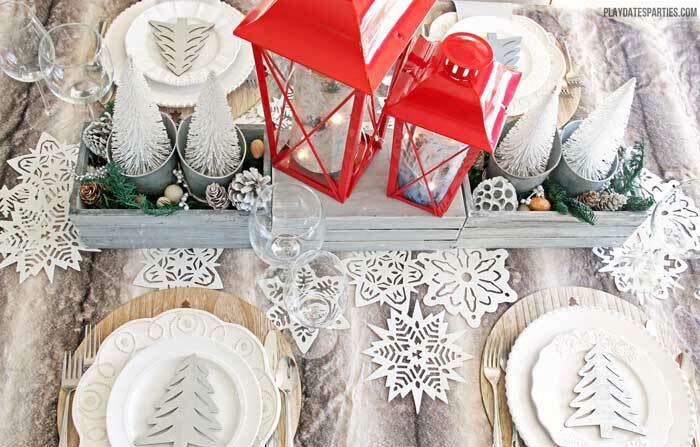 We have no plans to host dinner this year, yet I stll got an itch to pull together winter tablescape for the holidays. I’m pretty sure it happened when we were visiting my mom in October, and I saw some fur placemats in one of her holiday catalogs. They are totally impractical and overpriced, yet I still loved them. There was no way I was going to spend nearly $30 a piece for placemats that would get bits of food stuck in the nap and would require hefty dry cleaning bills after each use. Think about it; for a family of four, that’s almost $120 just for the placemats. 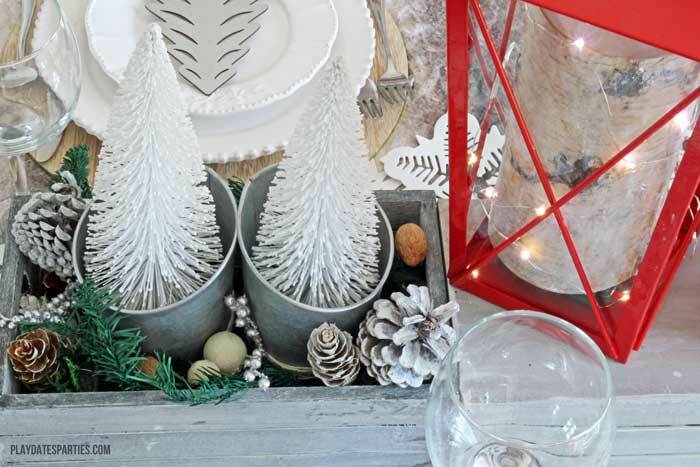 So when Oriental Trading Company contacted me about showcasing some of their products for holiday decor, I jumped at the opportunity to pull together a budget-friendly, yet elegant woodland holiday tablescape that looks like a million bucks. Until recently, I thought of Oriental Trading Company as a place to find throw-away items. That’s where I would look for cheap party favors and decor that I could throw away immediately afterward. But it turns out there’s SO much more to their stock than that. Can you spot the Oriental Trading items in the photos below? I’ll give you a hint…it’s not the foam snowflakes (I’ve had those for years) or the wood trees on the plates. 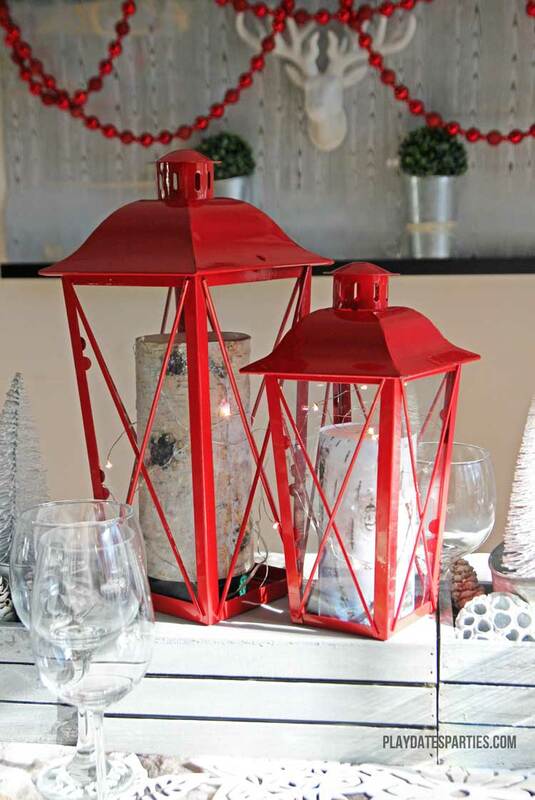 Would you believe that Oriental Trading sent the red lanterns (also available in black and silver), galvanized bottle vases, and boxwood decor balls? And less expensive alternatives to much of what you also see on this table could also be found on their site! The best part is that almost everything you see here can be used over and over again. And that’s where the savings really exists. 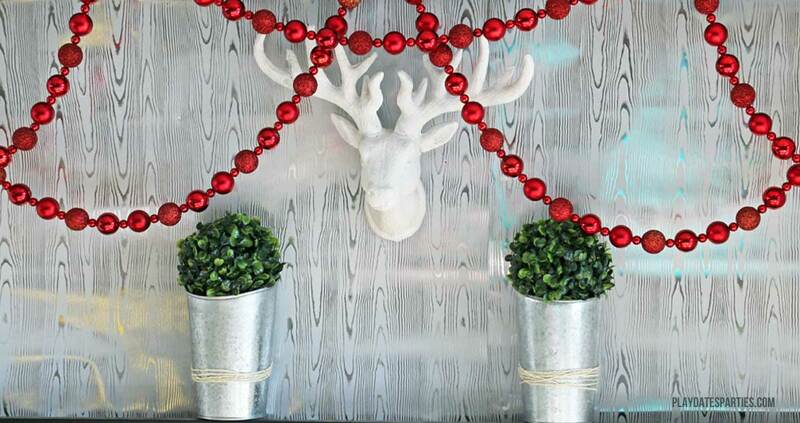 For example, my favorite piece, the galvanized steel bottle vases are ridiculously versatile. Even though they’re not water tight, a small mason jar fits inside perfectly, so you can use them as a table vase. They would be perfect for holding utensils or a curl of napkins at a party. And how cute would those be with individual bottles of champagne for New Year’s Eve? You can bet you’ll see me use them over and over again. 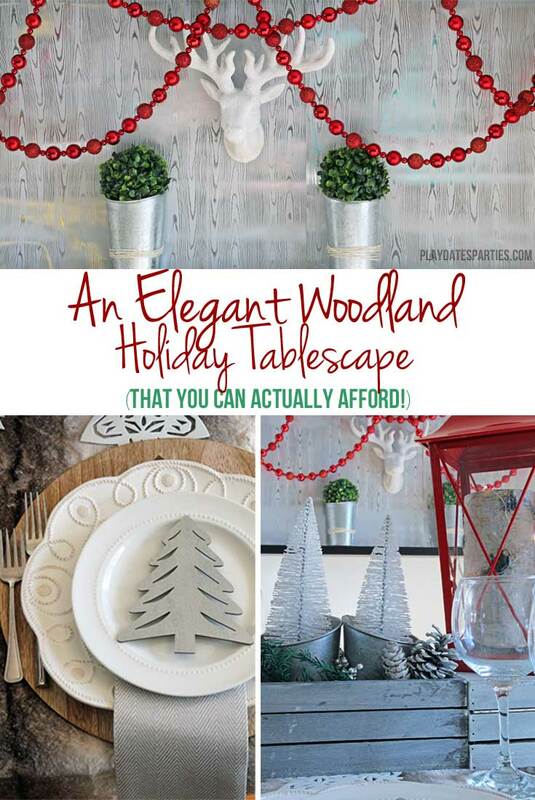 So what about the rest of this elegant woodland holiday tablescape? I did my best to get creative with items we already had on hand, including the foam snowflakes, red bead garland, birch candles, battery-operated teardrop lights, mismatched white ceramic plates, mismatched flatware, and the white deer head. The backdrop behind the deer head and red garland is actually just wood grain wrapping paper. I found the roll at Home Goods for around $4, and there’s plenty left for the rest of our holiday wrapping. The napkins are actually high quality disposable napkins left over from Thanksgiving as well. Yes, I included disposables for a dinner party tablescape. Don’t think you can’t use disposables for an elegant dinner party. 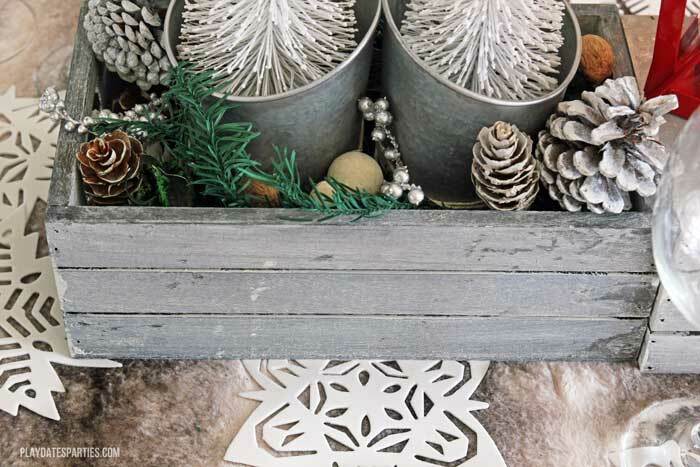 The greenery, pine cones and such in the wooden boxes all came from a large bag of vase filler found at Home Goods. 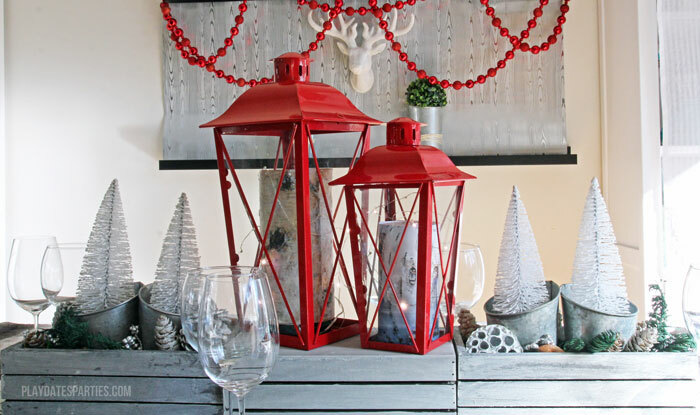 Simple, inexpensive and it adds the perfect touch of holiday green to go with the bright red pops of color from the lanterns and garland. But what about those fur placemats that would have cost nearly $120 for a family of four? Obviously I didn’t buy the originals. And I didn’t spend any time crafting new fur placemats, either. That still wouldn’t be very useful in the long run, would it? The item that helps pull the whole thing together is actually a $25 faux fur blanket. It’s machine washable, and at 60 inches long, it’s a great length for a four-person tablecloth. 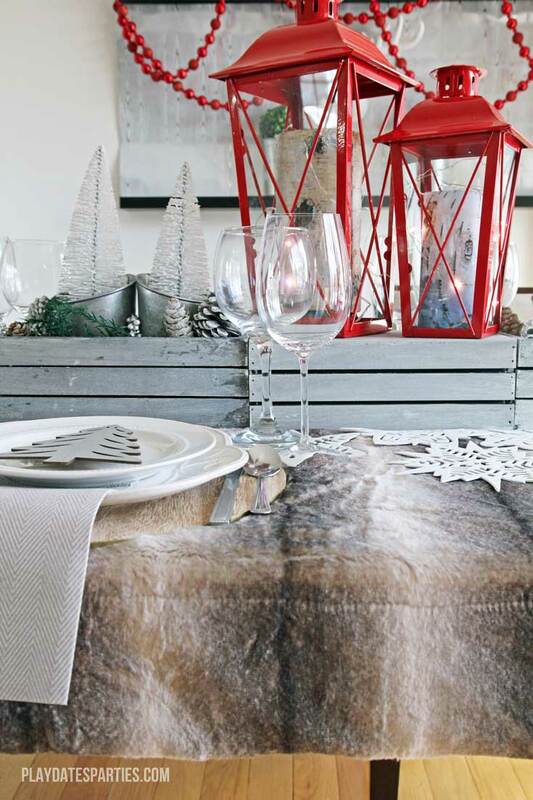 If you’re hosting a larger party, put a white tablecloth underneath or fold it up lengthwise and use it as a table runner on a wood trestle table. As a matter of fact, I’m even warming myself up under the blanket while writing this post! 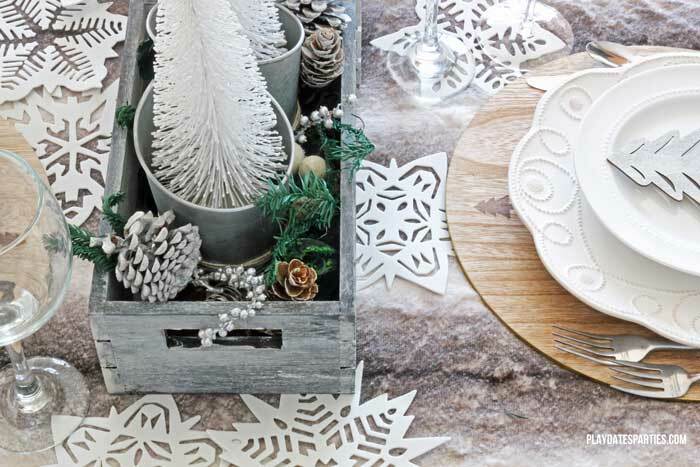 You don’t have to break the bank to create an elegant woodland holiday tablescape. All it takes is some creativity! What are you waiting for? 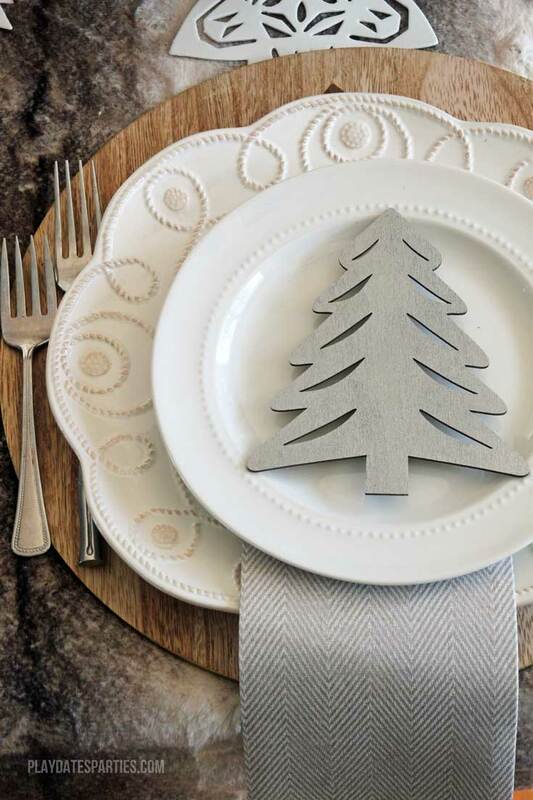 You can get started creating your own budget-friendly elegant holiday tablescape here and here. I’m in awe. I can’t believe those lanterns are from Oriental Trading. They look so nice and I’ve seen similar ones sold at antique stores for hundreds of dollars. Wow, you are amazing! I think you need a magazine cover with this one. It is that beautiful! THANK YOU for reminding me about Oriental Trading Company! I had completely forgotten about them. Their stuff is always so cute and affordable. I used them once for a luau-themed bridal shower and it turned out terrific. Your table looks stunning! I can’t get enough of the winter wonderland look. Some very cute ideas. I love your mix of grey, white, and red. 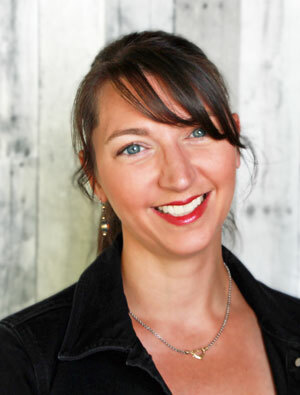 Thank you for sharing at The Crafty Corner! I love the neutral and organic colors in your tablescape! it really looks like a magic woodland! I also love how you used those red accents!